Peter Cunningham (right) and his teammate Jackie Creasey reach out for a fist bump during a March 20 training run in preparation for the Boston Marathon. Running a marathon is not an easy task, yet thousands of people swarm the streets of Boston each year on Patriots’ Day to participate in one of the biggest races in the world. “It’s the most prestigious marathon in the world next to the New York City marathon,” said Peter Cunningham, a recent Northeastern graduate who is running the race this year. The Boston Marathon has been a beloved citywide event since it debuted in 1897. People from all over the world come to the city to experience the race, whether that be by running it or cheering on racers from the sidelines. 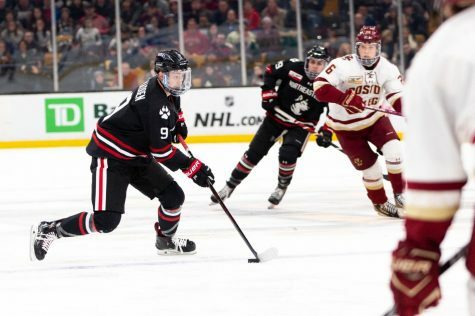 This year, a number of Northeastern students and alumni will be running the 26.2 mile course and have spent the past several months training and fundraising for the big day. 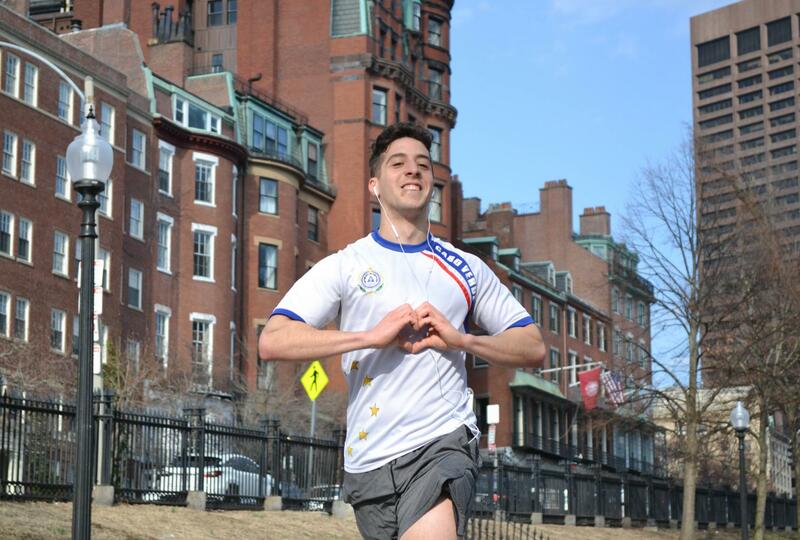 Third-year chemical engineering major Andrew McGlynn is part of Northeastern Club Running, and Monday’s race will be his second full marathon. Last year, he ran the Providence Marathon in Rhode Island and finished with a qualifying time for Boston on his first try — a feat which usually takes even the best runners several attempts to accomplish. McGlynn has been running competitively for seven years, starting his freshman year of high school and continuing into his time at NU. To train for this race, he runs an average of 30 miles per week. That number reached closer to 50 as Patriots’ Day nears. While McGlynn is running as part of a qualifying heat, he is trying to keep some of the pressure off of himself and just wants to run the race to the best of his ability. He said he is not running to win by any means, but rather plans on racing against himself to beat his best time and complete the course in under three hours. If a runner doesn’t achieve a qualifying time, the other way to enter the Boston Marathon is to get a bib through a charity. This method requires fundraising on behalf of the runner, and each year, thousands of runners participate in the race this way. Cunningham, a 2018 Northeastern graduate, was invited to run the marathon for the American Foundation for Suicide Prevention, or AFSP. After he applied to run for them last year and was rejected, they reached out and asked him to run this year. The fundraising goal for each of their runners was set at $12,500, but Cunningham upped his goal to $15,000, for he strongly supports and believes in AFSP’s work. Peter Cunningham is running the race for the American Foundation for Suicide Prevention charity. Cunningham has only been seriously running for three years and this will be his first marathon. His goal is to complete the race in qualifying time, which would be just over three hours. Ian Herrington is another 2018 Northeastern graduate who will run the marathon on Monday. He is running for Grab the Torch, a charity that hosts programs for high school-aged girls of all backgrounds to help build leadership skills and plan for their futures. Herrington was moved to run after he spoke to a young woman who participated in the program and now works for the charity. While not a huge runner himself, he saw the race as an opportunity to help raise money to support girls like her. 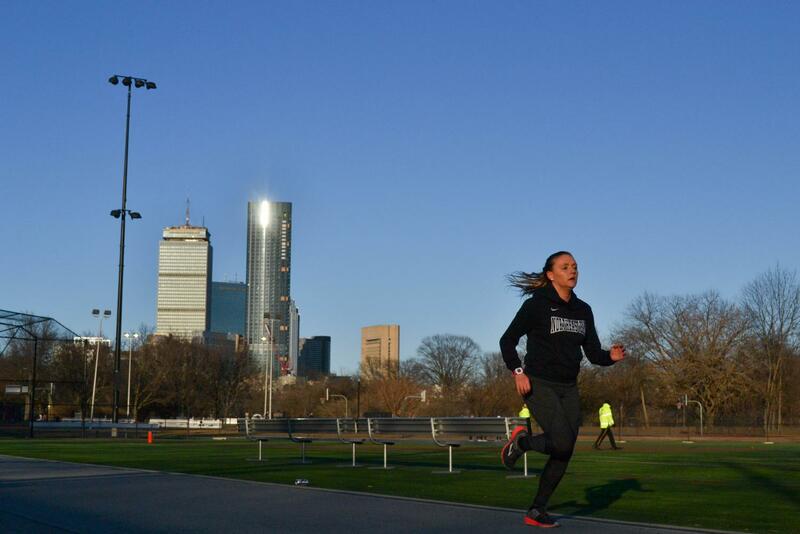 Danielle Voke trains for the Boston Marathon at the Roberto Clemente Field Athletic Track on March 26. Danielle Voke, a fifth-year behavioral neuroscience major, is running the marathon on Monday as part of the Peer Health Exchange, a national nonprofit that teaches health education in Boston Public Schools. Voke, who is from the Boston area and ran for Northeastern on both the cross country and track and field teams, is looking forward to race day. The race kicks off on Monday with the first wave of athletes starting at 8:40 a.m. on Main Street in Hopkinton.